Now that the cold and snowy winter has reached our home here in Toronto, I’m thinking back to the very hot summer road trip to the U.S. that we took this past summer. I love country and bluegrass music. My husband is a fan, too. So we decided to drive to the southern U.S. and get ourselves to a music festival. More on that slice-of-life later. First, our little American road trip took us to Nashville, a city I’d heard great things about. It was a bit of a last-minute decision to go there–friends we’d just seen in Indianapolis made the suggestion, as it was “only” five hours south of there–so we had zero plans, and very little knowledge, of the place. All we knew was it would be a great place to see some live music. We found a sweet last-minute deal at the freshly renovated Clarion Hotel. It’s not really within walking distance of the main Broadway or Gulch music neighbourhoods, especially in the August heat, but it’s just over the Cumberland River from there, and only a five-minute drive via the free hotel shuttle. The room was super clean and comfy (we had a great view of downtown Nashville) and the staff were so accommodating and friendly. Great breakfast (included in the room price), too. 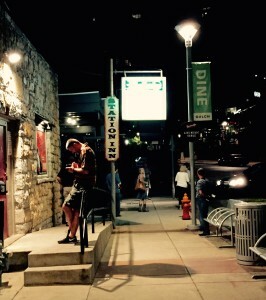 Later on that same evening, we found another legendary place in Nashville to see live music: The Station Inn, in The Gulch neighbourhood, about a 15-minute walk from where we were on Broadway. It was our luck to be there for their weekly Sunday night Bluegrass Jam (no cover charge), and it was excellent. 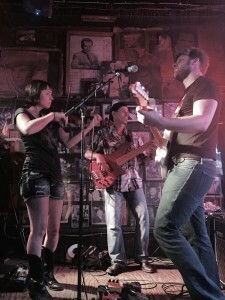 The Station Inn is known as a bluegrass place, which suited us just fine. It’s been going for more than 40 years, and has featured the most famous pickers, including renowned “father of bluegrass music” Bill Monroe. 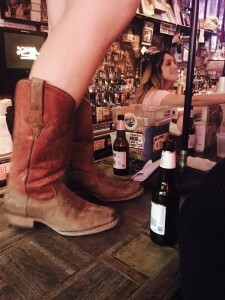 We liked the atmosphere of this place so much we went back a second night, for a more “classic country music” experience via the star-studded New Monday band ($12 cover charge)–worth every penny and more. Who needs the Grand Ole Opry? I haven’t talked about the food in Nashville yet, but stay tuned for my next post.